The last weekend of July we enjoyed the annual Spanish Market in Santa Fe. It is one of the few large fairs which occupy the entire center of town. The streets around the Plaza are all closed down for mostly exhibition booths but also a section of food kiosks. Founded by the Spanish Colonial Art Society which was formed in 1925, the first fair was held in 1926. It has continued ever since, though between 1935 and 1965 it was mixed in with Indian Market which I will be writing about in a few weeks time. The weekend is kicked off by a special preview of works submitted for prizes with the winning entries tagged with ribbons. 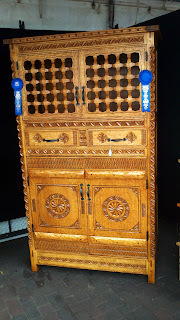 They are divided into various categories such as Straw Appliqué, Textiles, Furniture, Pottery and Bultos which are carvings and Retablos which are paintings on wood of religious subjects. The Spanish Colonial Society has been very strict in insisting on an adherence to traditional values but for the first time this year a category for innovation within the traditions is being allowed for 30% of an artist’s booth, if, that is, he has been “juried in” (been approved) for that category. An artist has to have been in the Market for at least two years to qualify. 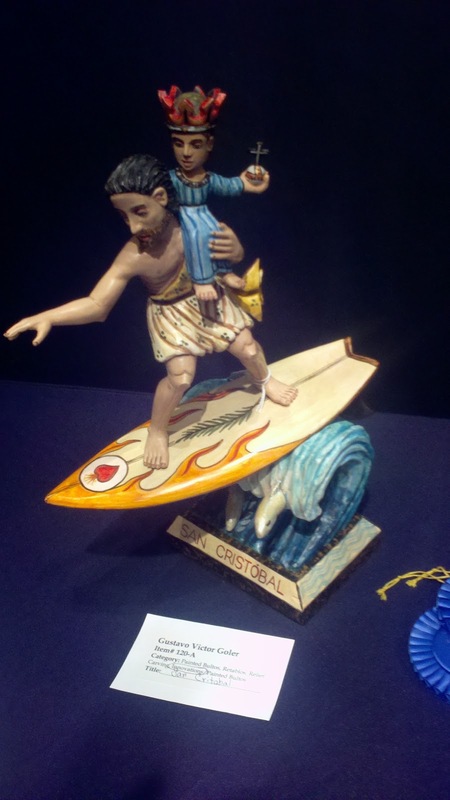 Here is an example of an original interpretation of a St. Christopher by Gustavo Victor Goler which won this year’s blue ribbon for innovation. Twenty-five years ago the artists who did non-traditional Hispanic art could not get into the traditional market so they rebelled and created their own show, called the Contemporary Hispanic Market in the court yard of the Palace of the Governors. These days, however, they occupy two long blocks perpendicular to the Plaza with booths as far as the eye can see. Frankly, we were rather disappointed in the Contemporary Market offerings this year, though in former years many excited us. What is nice about fairs are the surprises one can have, but there are never so many that you get bored with the treasure hunt. 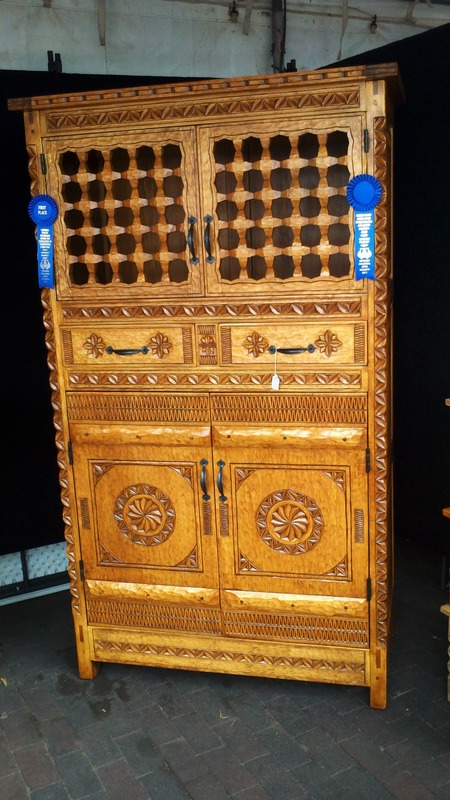 There are several excellent furniture makers at Spanish Market but I believe the best this year is Andrew Garcia who won the blue ribbon for this trastero. He also makes tables with uneven hand-gouged and smoothed tops sloping towards the edges. Not great for writing on but absolutely wonderful to both the eye and touch. There is always a great deal of tin work on display and it is amazing how certain artists stand out in their work. 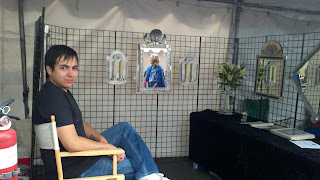 Justin Gallegos Mayrant is one of those and here he is in his booth with a few of his pieces. Using a raised or layered frame his work appears to be three-dimensional, distinguishing it from the work with more punched ornament on flat sheets which describes much of the other tin work in the show. Last Year Justin showed a Madonna in tin that bore eyelashes (now that was a first!). The artists often have a book of illustrations in their booths so that the visitor can span the artist’s potential and possibly commission a work, be it a frame for a photo or a beautiful Madonna. We met a contingent of visitors who came down from Denver for the Market. Among them were three curators, a conservator as well as docents and collectors who buy for their own collections and upon occasion for the Denver Art Museum. They come every year to look, study and keep up with what is happening in their field of interest. It is no coincidence that Denver has one of the foremost Spanish Colonial Collections in this country. There is plenty for one and all at Spanish Market.